Adai Dosa is one of the healthiest breakfast recipes. 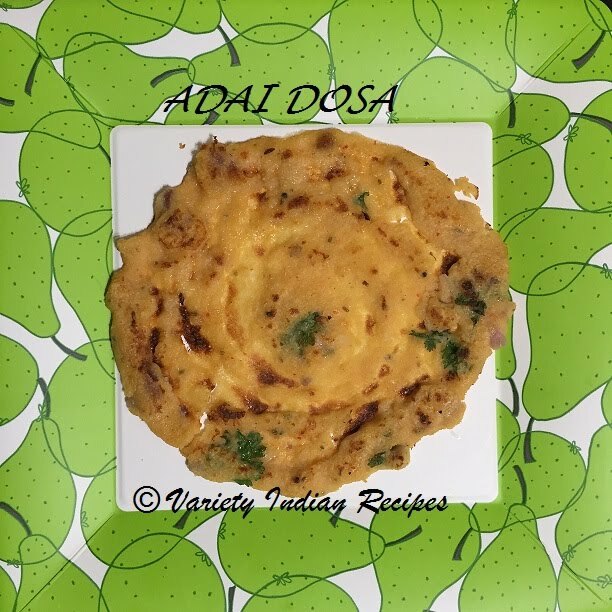 Adai dosa is a type of dosa made with multiple variety of lentils and rice. It is not only healthy but tasty too. Adai Dosa with coconut chutney is a great combination. This type of dosa does not require fermentation too. Soak the rice(raw rice and idli rice) and dhals(urad dhal, toor dhal, channa dhal, moong dhal) for a minimum of 3 to 4 hours. Grind the soaked rice and dhals with red chillies, tomatoes and fennel seeds to a coarse paste. Add coriander leaves, salt to taste and mix well. Heat oil in a pan, add cumin seeds, asafoetida(hing) and curry leaves and saute for a minute. Now add onions and saute for a minute. Heat a griddle or a dosa tawa. Take a ladle of batter and spread the batter over the tawa. Take a table spoon of oil and drizzle it over the dosa. Once the lower side of the dosa turns golden brown, flip the dosa and allow the other side to cook . Once both the sides of the dosa have cooked well, remove from heat and serve hot with coconut chutney.